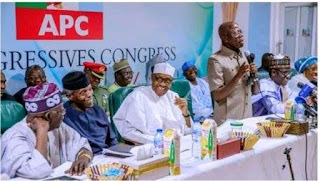 All Progressives Congress who are the rulling party on Wednesday said that only the decision on the party's preferred candidate for the position of the Senate President for the 9th Assembly had been taken by the law makers. "Just as the media and Nigerians have been informed about who our preferred candidate for the Senate Presidency is, we will come out to tell you what the zoning formula will be for the remaining positions in the Senate and also in the House of Representatives very shortly." "I was at the dinner along with other APC senators-elect, the National Chairman of our party, Adams Oshiomhole, never made any announcement or submission that can be described by anybody as imposition. "He said in the spirit of avoiding what happened in 2015, the party leadership along with the Presidency, gave the required direction for the party as regards the position of President of the 9th Senate in a very persuasive and convincing tone and recommended Senator Ahmed Lawan for the position. "Let me tell you very clearly that we have been engaging our colleagues in the PDP and I will tell you that majority of them are actually working for us to see that we have a harmonious, rancour-free, non-tumultuous Senate.